Scallops are bivalve mollusks—like oysters and mussels—with two shells that hinge together and meaty deliciousness inside. Some scallops attach themselves to rocks, but most of the ones harvested and sold move about the sea by snapping their shells together, which develops a muscle called the "eye," a pale, sweet-flavored muscle that is sold, served and eaten. Scallops are sold either "wet" or "dry." Look for "dry," natural scallops that have not been treated with any chemicals. "Wet" scallops are treated with phosphates, which causes them to absorb water. This extra water makes them heavier and thus more expensive. The water also dilutes their flavor and makes them not just easy to overcook but almost impossible to sear or brown properly. How can you tell the difference between wet and dry scallops? 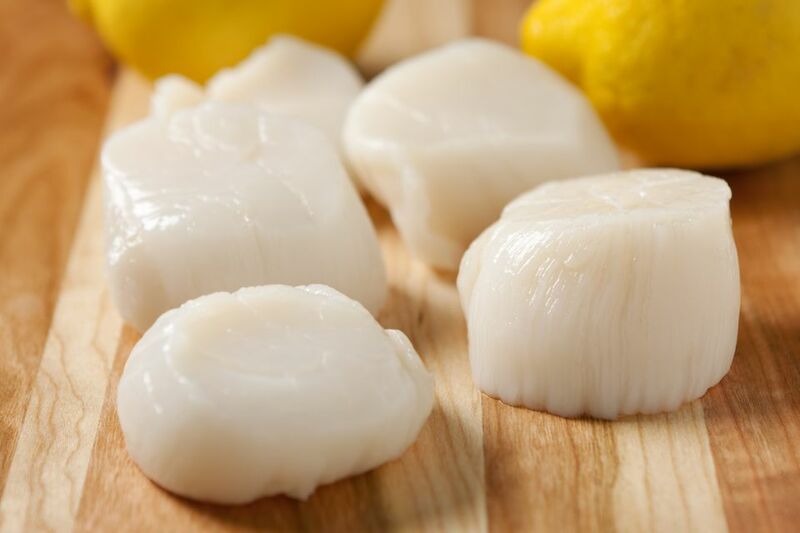 You should just be able to ask the fishmonger, but there is a visual clue that usually gives the game away: "wet" scallops tend to be snow-white in color, whereas "dry" scallops are a natural pale vanilla color. If you're really lucky, you'll find scallops still in their shells. There are two types of scallops commonly seen at fish counters. The most coveted are the sea scallops (Placopecten magellanicus), shown above, sometimes called weathervane scallops. These are the scallops you see on restaurant menus. They are most often served seared or sliced thinly and served raw as sushi or crudo. Smaller and just as sweet, bay scallops (Argopecten irradians), are also delicious. They're usually served in soups, stews, or salads, but can also be served on their own. Bay scallops live in the reedy seagrasses of ocean bays and their populations have dwindled in recent decades. Luckily, efforts to raise them in environmentally sustainable aquaculture are getting off to a good start. Rock scallops (Crassadoma gigantea)—those that cling to rocks instead of swimming at sea—are less common and most often seen at restaurants or the home kitchens of those who harvest them. Unlike sea scallops and bay scallops, both at home in the Atlantic Ocean, rock scallops are found in the Pacific. Farmed (or "cultured") scallops are a "best choice" from Seafood Watch (a particularly sweet and meaty scallop is being grown in British Columbia—keep your eyes open for them). "Diver" scallops are hand-picked by divers and can be the best choice. Avoid scallops caught by dredging, which harms the environment and other sea creatures. All scallops should be cooked quickly to maintain their delicate texture. Overcooked or dried out scallops turn tough and chewy. Scallops can be poached, sautéed, broiled, baked, or fried. Many old-fashioned recipes douse scallops in heavy sauces, but we prefer cooking scallops with little-added fat so the full flavor of the sweet, light meat shines through. Quickly searing scallops over high heat in a bit of butter is perhaps the easiest and most delicious way to cook scallops. Although tossing small scallops in this creamy seafood chowder is tasty, too.